The Jeep® Grand Cherokee has developed quite a loyal following in its time on the market. The Grand Cherokee is a unique blend of legendary Jeep capability, refinement and innovative technology. Historian John Dalberg's oft-quoted dictum that "power tends to corrupt, absolute power corrupts absolutely" can be sprinkled liberally across the automotive spectrum. Anyone familiar with an early Saab 900 Turbo (RIP) will attest to this. Here though, it takes on a grisly significance. This is the Hennessey HPE800 Twin Turbo Jeep Grand Cherokee SRT8. That 800 in the moniker stands, naturally, for how many horses have been strapped under the Santa-spec red bonnet. 805bhp, to be precise, that ride shotgun with 823 torques to give a 0-100kph time of 3.1 seconds. That's fractionally, fractionally faster than a Ferrari 458 Italia. Mr Hennessey tells us it'll do the standing quarter mile in 10.9 seconds, travelling at 210kph. That massive 6.4-litre V8 gets rebigulated to 7 litres, treated to two turbos and mated to an upgraded transmission and torque converter. It also gets 20in wheels, much leather and Alcantara, a Brembo brake system, lowered sports suspension and a carbon fibre lip spoiler. Says Mr Hennessey: "This vehicle is designed for the performance minded driver who live in Aspen or Moscow and wants to be the fastest in all weather conditions." Or indeed, the driver who enjoys plastering looks of sheer surprise across supercar owners at the lights. Yikes. Just 24 will be built, with prices starting from Rs 1.23 crore. Jeep® Grand Cherokee hits the sweet spot of premium on-road performance and legendary class-leading Jeep capability. For 2012, Grand Cherokee has been taken to an entirely new level thanks in part to its class-exclusive Quadra-Lift®Air Suspension system. With the push of a button this high-tech system can give Grand Cherokee an instant "lift" and elevate over 4 inches, when needed. Maximum Best-in-Class Ground Clearance is a remarkable 10.7 inches. The novel closed-type air suspension system sends pressurized air to the springs, as needed, for fast adjustments on the trail or when taming a nasty pothole strewn road. The four-corner air bladder springs absorb and smooth out every bump and dip for an uncompromising ride and feel for the road. Grand Cherokee features an available Rear Load Leveling Suspension (part of the Trailer Tow Group and Trailer Tow Group IV, when properly equipped) that uses high-tech Nivomat® monotube shock absorbers for premier performance. The mechanical, self-energizing hydro-pneumatic shocks have fewer parts compared to an air system and offer significantly improved roll stability. For the best handling Jeep vehicle ever, Grand Cherokee SRT8® features an advanced, new adaptive dampening suspension managed by new Selec-Trac® system, delivering up to .90 g on the skid pad. Control. Capability. Brake-through performance: all-weather, all the time. 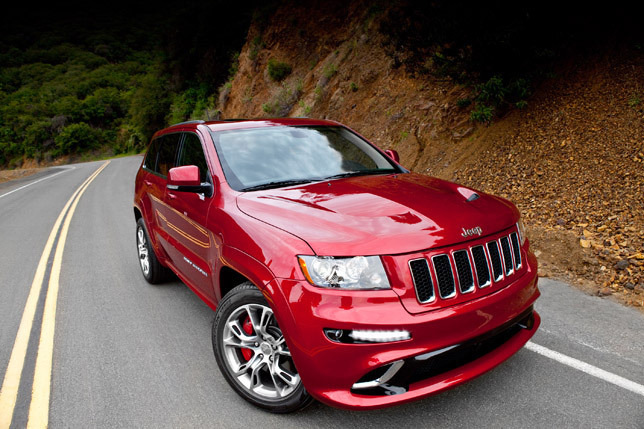 The SRT8® comes from a line already known for world-class, outstanding braking. Stopping power for the 2012 Grand Cherokee SRT8 comes courtesy of new SRT® high-performance Brembo brakes with four-wheel antilock brake system. Stopping distance performance of 116 feet from 60-0 mph is made possible by the new red-painted, Brembo 6-piston (front) and 4-piston (rear) calipers, with vented rotors at all four corners. At first sight you know it's a Grand Cherokee, but it looks like it's been to the gym. The sculpted muscular appearance of the All-New 2011 Jeep® Grand Cherokee is a masterful meld of classic styling cues and modern design. Look beyond the signature seven-slot grille, round headlamps and trapezoidal wheel arches and you'll see thoughtful details that set Grand Cherokee apart. Longer front and rear door openings for those of us who aren't acrobats and felt-lined wheel wells to keep it quiet on rock-spitting gravel roads. Just a few of the significant features designed to make every moment Grand. Adaptive Cruise Control automatically adjusts cruising speed to maintain a preset distance between your vehicle and the one ahead. This feature is bundled with a number of key high-tech features into a new Advanced Warning / Adaptive Cruise Control Group that includes: Adaptive Cruise Control, Forward Collision Warning, Blind Spot Monitoring, and Rear Cross-Path Detection.